Come and relax at our refuge and share with us your adventures through the land of the Incas. Begin your journey at a comfortable and cozy house in Miraflores, three blocks away from the touristic Center and a two minute walk from the seafront. We have restored a traditional house from the early twentieth century in keeping with its original style and provide all the necessary amenities to insure that you will have a pleasant stay in a comforting and relaxed atmosphere. In KACLLA, The Healing Dog Hostel, we love to take care of you. Every day we offer you a delicious, healthy and nutritious breakfast, included in the cost of all of our room rates. Every morning you will enjoy a glass of natural orange juice, fresh baked rolls, tea, coffee and milk. All this comes accompanied with our homemade peanut butter, fruit jam and granola (composed of oat, wheat, raisins, peanut and quinoa); all naturally sweetened with chancaca or panela (wholemeal and unrefined cane sugar). Our men’s and woman’s bathrooms are spacious and specially designed as clubhouse bathrooms. Showers and toilets are in separate rooms. You can always take a long and relaxed shower at the beginning or end of your day’s adventures as hot water is provided 24 hours every day. A cozy living room is at your disposal to meet other travellers and share your adventures, or just to relax and watch some cable TV, watch a DVD movie, play a board game, play some music or maybe paint a nice picture. But if you need some privacy, there is a reading room with books for exchange. Our kitchen is fully equipped with burners, oven, microwave, fridge and all the cooking utensils you might need to prepare anything you want. There is internet wireless connection in all areas, but if you don’t have a computer we can lend you one. Our staff is at your full disposal 24 hours. We provide touristic guidance and offer recommendations if you want help designing your own personalized adventure itinerary. We offer 6-Bed Shared Dorms and 2, 3 or 4-Bed Private Rooms; all of them equipped with personal security lockers. We also have Double Bedrooms equipped with a cabinet. We provide sheets and pillows as well as courtesy blankets and towels. KACLLA is the quechua name for the Peruvian Hairless Dog. Due to the texture of their skin and the fact that they are three degrees warmer than the normal canine temperature, kacllas have been used for millennia by indigeneous Andean civilizations as pain relief for rheumatism and other ailments. KACLLA, The Healing Dog Hostel, is a cozy rest and mind-renewing centre where we intend to give you channels of connection with indigeneous culture and your inner self too. Das Hostel ist total liebevoll eingerichtet, die Zimmer sind groß und bieten viel Stauraum. Die Lage ist perfekt, im Zentrum von Miraflores aber trotzdem ruhig. Really good Hostel, with a really chill vibe and realy easy to meet other travellers. Really close to everything you need. Really clean and has everything you need. 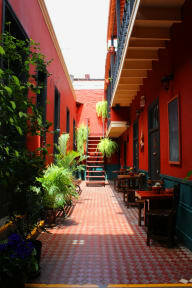 Awesome stay, yummy breakfast, a really friendly staff in the coolest hostel in Miraflores! 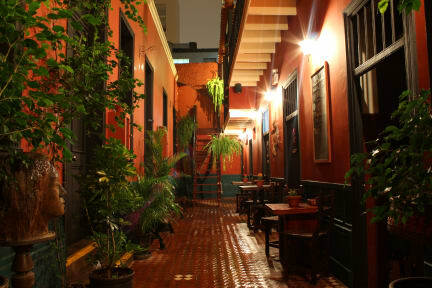 I stayed there for 3 nights after my arrival in Lima. Very clean and quiet hostel. They have a great breakfast. The staff is very helpfull. The entrance is always closed and you need to ring a bell to enter the hostel, there are additional lockers in every room, Overall a tiny and comfy hostel I only can recommend. Schönes Hostel in zentraler Lage. Gemütlicher Innenhof der zum quatschen und ausruhen einlädt. Das Personal ist überaus hilfsbereit. Das Frühstück ist lecker und ausgewogen, gegen einen Aufpreis kann man das Essen noch erweitern. Leider keine Klimaanlage. Wer ein ruhigen Start mit netter Umgebung in Lima sucht der ist hier bestens aufgehoben. Restaurants und Einkaufszentren maximal 10min zu Fuß erreichbar. This is a very pleasant hostel with great breakfast, friendly staff and a nice & relaxing atmosphere. I enjoyed it very much - it’s also close to surf spots! Gemütliches Hostel mit freundlichem Staff und superleckerem Frühstück. Die Zimmer sind sehr gemütlich und mit großen Lockern für den Rucksack ausgestattet. Die Betten sind sauber und bequem. Das Wifi funktioniert einwandfrei (auch auf den Zimmern). Einzig schade ist, dass es keinen großen gemeinsamen Esstisch gibt (2er Tische), so bleiben viele unter sich. Die Küche ist klein, hat aber alles was man braucht. Würde jederzeit wieder buchen und kann dieses Hostel nur empfehlen! Schönes, gemütliches und sauberes Hostel. Aber Achtung versteckte Zusatzkosten z.B. wenn man nach dem Check out noch dort bleiben muss um Zeit zu überbrücken, muss man 15 soles pro Person zahlen um sich weiterhin im Hostel aufhalten zu dürfen. Alles top! Sehr freundliches Personal und alles sauber. Man bekommt, was man verspricht!